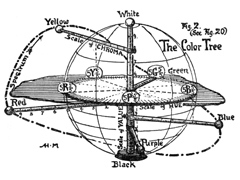 Munsell’s early work in color theory, culminated in his book A Color Notation (1905) and two years later his Atlas of the Color Solid, which was the predecessor to today’s Munsell Books of Color. Munsell didn’t develop his groundbreaking work in a vacuum. Instead, he conferred with academics in the physical and psychological sciences, and later in his career was invited to present his color order work at conferences throughout Europe. The National Cyclopaedia of American Biography Volume XII, James T. White & Company, New York, 1904, pg. 316. A Practical Description of The Munsell Color System with Suggestions for Its Use, T.M. Cleland, Munsell Color Company, 1937, Baltimore, Md. A Color Notation, A. H. Munsell, Munsell Color Company, Inc., 1971, pg. 45.